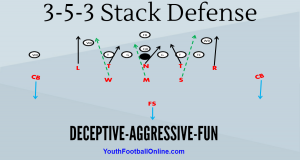 One of the main goals for our youth football team is to dominate the special teams’ phase of the game. Many youth football teams overlook special teams, but not us. Since we understand the importance of field position we will practice and excel in all phases special teams. We will win the special teams battle game in and game out. We will pride ourselves in solid coverage on punts and kickoffs. We will cover punts & kickoffs with extreme shed blocking skill, speed, power, and discipline (lane assignments). We will tackle and dislodge the ball from their return guy, ultimately gaining another offensive possession. We will hustle down the field and make a play on all kickoffs. We will not allow big returns-this will help us win the field position battle. We will be flawless in our onside kick recovery team-we will practice it every practice. Having good execution on an onside kick can be the difference between winning and losing. We will be able to get the ball back by recovering an onside kick anytime we choose to do so. We will pride ourselves in having positive punt & kickoff returns. We will gain large amounts of yardage and do some scoring with our return teams. Scoring on special teams and winning the field position battle will tremendously help our team achieve a positive outcome at the game’s conclusion. We will be disciplined with our punt return blocking assignments and punt rushing (block the punt) scheme. We will be perfect in our onside kick recovery team. Having good execution with our hands team is essential for securing our scoring lead! We will pride ourselves on making every extra point attempt (kicking the extra point is worth two points in youth football). We will practice long snapping, holding, & kicking the ball every day. It is essential that we convert on all extra point attempts. We will become sound with our extra point block teams as well. We will not allow a team to kick the extra point (field goal) on us. We must execute our extra point block scheme flawless to deter teams from getting two extra points. Being strong in the youth football special teams phase of the game will be a key part to our team’s success. We will win the field position battle with solid kickoff and punt coverage. We will also use our punt and kickoff return teams to set up our offense in good field position, as well as score some points. We will practice punting/ kickoff direction & distance every practice. We will practice our long snapping, holding, and extra point kicking every practice until it is perfect. Teams over look special teams, not us we will practice special teams every day. We will have a distinct advantage in special teams. We will score points and win the field position battle. This will help lead our team to VICTORY.